Looking to buy your dream art? No worries, we ship Worldwide! Shipping Cost is $39 (US $) for Original Paintings. FREE Shipping with purchase over $499 (US $). To Canada: Original Paintings of all sizes (except for Oversized Paintings) are shipped stretched, ready to hang, wired and with all hardware included. 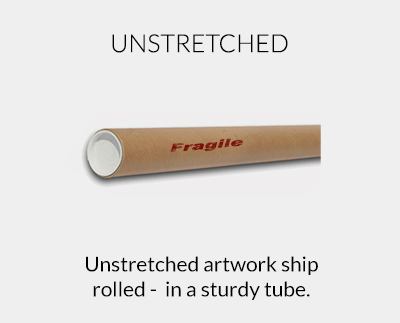 To other Countries : Original Paintings of all sizes are shipped unstretched, rolled in a sturdy tube. Additional shipping charges may be required for some countries/cities. For example, shipping cost to Australia and New Zealand is $59 - rolled. All prices are stated in U.S. dollars and do not include any sales, use, value added ("VAT"), goods and services ("GST") or similar taxes or withholding taxes or any customs, duties or tariffs that may be assessed by any governmental tax authority or that are otherwise payable under applicable law with respect to the purchase. Taxes and duties charges are not included in the item value or shipping costs. Buyer accepts responsibility for taxes and duties costs. Insurance, tracking number and signature confirmation apply to most shipments. We do not declare the artwork below value or mark items as a gift, as it is illegal according to US and International Government regulations. All Paintings for sale are available for immediate shipping and they usually take 2-3 business days to ship after payment is received and cleared. 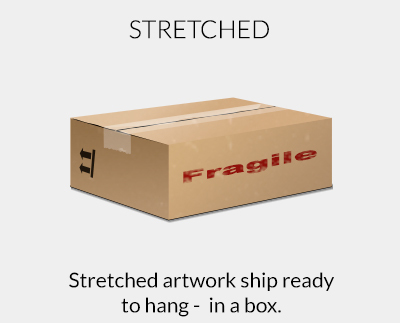 Paintings 48" x 36" are considered "Oversized" by the shipping carriers. Estimated transit time is aprox. 5-15 days plus your local custom's time. We are not responsible for shipping delays, damages, or omissions caused by the carrier or your country's customs. For more information, visit Painting Info, FAQS, and Terms. You may be required to pay duties and taxes to claim your package, depending on your country and local customs regulations. We are unable to determine duties and taxes in advance, and are unable to control these additional charges. We encourage you to contact your local postal service or customs bureau for more specific information before your purchase. Yes, for most countries. Due to shipping restrictions, we are not able to ship products to certain countries. In this case, we will notify you via email. What Metric Unit do you use for your artwork? All paintings and prints are stated in inches ("). 1 meter = 39.37 inches. If you need a conversion tool, use the length converter link below. Estimated Import Duty and Taxes Calculator.